Yes that’s me at the shooting range. I preach and practice kindness, but there are times I get sick and tired of some stuff. That is when the line from the movie Network starts richocheting throughout my heart, soul, and brain. If you haven’t seen the movie, I’d recommend it is a good one to rent or get from your local library. The line I’m referring to is “I’m mad as H— and I’m not going to take it any more.”I don’t shoot people or animals, but I have been known to rant loudly. 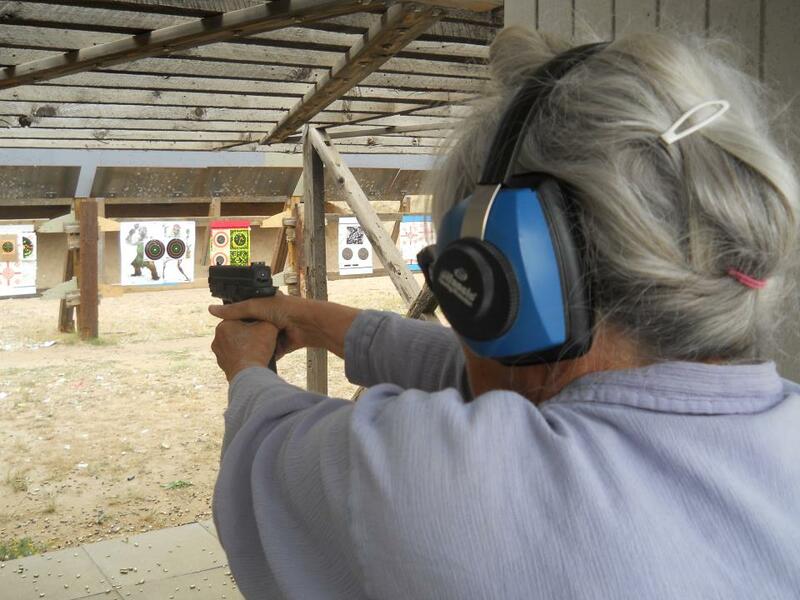 From now own, if you see this picture of me at the Shooting Range, know I am shooting angry words and hoping someone will hear or read and understand. Isn’t that what you want when angry? TODAY’S RANT: I woke up this morning from two nightmares. In the first, I was out walking a usually peaceful hiking trail. “Slam Bang” a skate boarder came barreling after me. He wasn’t trying to avoid me. He wanted to run me down. Right behind him on their skate boards came a man and a woman. I assume they were his parents. I thought briefly they were going to save me, but no, “Get her” both yelled. I woke up before being knocked down by the boy and run over by his parents. My brain won’t let me die in dreams. Thank you brain. He probably did so because I didn’t move fast enough and he had to swerve around me. He was sixteen or seventeen. I would have been more forgiving of the one sparking this dream if he had been just entering his teens, but this guy should have known better. I’m sure he did not see my raised finger or hear my retaliatory use of the same words. Obviously, my brain holds on to the fear of some type of accident like that on the hiking trails. I avoid those used by bikers. I am on blood thinners and a bad fall could kill me or at least cause major brain damage and I do struggle with a leaking brain already. Anyway, I calmed my nightmare nerves with some deep breaths, thought calming thoughts and after a time returned to sleep, but not to a sweet dream. Instead, it was a How To Tame Your Dragon (HTTYD) dream. Only I was the dragon and I wasn’t being tamed, but pulled by a group of children toward a fiery pit. If you have been reading my blogs, you know I rant against the media painting parents as dolts and children as all wise and caring. The movie HTTYD is one that sets me off on such rants. I first saw it with my then four year old grandson. At first I was enchanted. It was a story saying be tolerant, understand what scares you, love and tame an enemy. Definitely supports my major message. Perhaps a good message for a child with an abusive parent. But not a great message when taken to extremes as happens in much of today’s world. By the way this “Adults are the problem” began with Jean-Jacques Rousseau. Who was he you ask? He was a philosopher, writer, and composer in the 18th-century. Some consider him the father of French Romanticism and the French Revolution. He was a champion of human rights. His message was right and important for his time. I think this is a good quote to think about, but not to swallow as the only truth. The media, the Happiness Gurus, the communication experts, those I call Soft Love parents (Parent Effectiveness Training, How to Talk so Kids Will Listen, and many parenting blogs) have taken this idea as the truth, the whole truth and nothing but the truth. WRONG. The advice of the the Soft Love parents is fantastic for the parents of teens but only if the child was also taught the right values when small. Tough Love parents are the best parents for kids from two to twelve. (Tough Love does not mean Abusive Love; and hear this: punishment is not abuse.) Such parents praise and punish and keep on caring. Their kids respect not just for their rights, but the rights of others. What is A Parent to Do? Protest. Go on an OAPM (Offensive to Adults and Parents) campaign. In fact, I want OAPM to become as widely used as the PG or X rated labels for movies and TV shows. My intent is not to ban such shows. In fact, I protest the political correctness that is for banning jokes about religious groups or making fun of your own race or even of mother-in-laws. My goal is reminded that we are in this world together. If any group is blamed or thought not worthy of care, kindness, and being treated with good manners, the world is teetering on the brink of destruction. My grandson smiled and agreed. JOIN MY PROTEST. Comment and let me know movies and media that teach children parents or adults are stupid or evil. This entry was posted in Parenting Issues and tagged A rant, challenging children, Emotional Health, help for parents, how to parent, Katherine Levine, parenting, Parenting advice, parents, postaday, teenager acting badly, Thinking about what matters, tips on parenting, When Good Kids Do Bad Things. Bookmark the permalink.